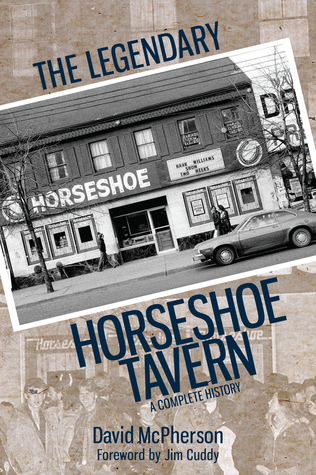 From Goodreads ~ Like the Queen Street strip that has been its home for seven decades, the Horseshoe Tavern continues to evolve. It remains as relevant today as it did when Jack Starr founded the country club on the site of a former blacksmith shop. From country and rockabilly to rock ‘n’ roll, punk, alt/country, and back to roots music, the venerable live music venue has evolved with the times and trends — always keeping pace with the music. Over its seventy-year history, the Horseshoe has seen a flood of talent pass through. From Willie Nelson to Loretta Lynn, Stompin’ Tom Connors to the Band, and Bryan Adams to the Tragically Hip, the Horseshoe has attracted premier acts from all eras of music. In The Legendary Horseshoe Tavern, David McPherson captures the turbulent life of the bar, and of Canadian rock. The Horseshoe Tavern (aka "The 'Shoe") is a bar at Queen Street W and Spadina here in Toronto. It opened in 1947 and though it has had different owners over the years, it's still in operation today as a music venue. The building itself dates back to 1861, when it opened as a blacksmith shop. It originally opened as a restaurant but soon became known for its country and western concerts, hosting soon-to-be superstars such as Willie Nelson, Conway Twitty, Waylon Jennings, Loretta Lyn, Charlie Pride and Ian & Sylvia Tyson. Over the years, the music styles have changed ... blues, folk, reggae, mod rock, punk, new wave, alternative rock, ska, surf, swing, Celtic, alternative country and more. Iconic Canadian bands played there when they were starting out ... Bryan Adams, Blue Rodeo, the Tragically Hip, the Watchmen, Big Sugar, Wide Mouth Mason, Great Big Sea, Stompin' Tom Connors, the Band, Helix, Prairie Oyster, The Jeff Healey Band and Our Lady Peace. Surprise concerts include the The Rolling Stones, Bryan Adams, The ‘Hip, Melissa Ethridge, Sammy Hagar and The Blues Brothers. 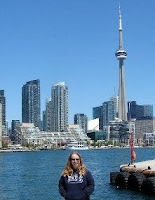 I enjoyed this book as I like reading about the history of Toronto, I like music and I used to go to The 'Shoe. When I moved to Toronto in the late 1980s, it was one of the places I went to hear live music as that was the time when Amanda Marshall, The Phantoms, Jeff Healey, etc. were just starting out. It was a dive bar but it was a fun dive bar. I haven't been to The 'Shoe in years. Their music focus has changed and evolved and they are bringing in bands I haven't heard of. After reading this book, though, I want to go back and check them out again. I liked the writing style of the book and it brought back memories of bands and bars I'd forgotten about (like The Diamond Club [now The Phoenix] and Albert's Hall). In addition to lots of interesting information and stories about The 'Shoe, there are interviews with those involved (like the owners, performers and even the bartenders) along with pictures. As a head's up, there is swearing. It's a must-read for anyone who is interested in the music scene over the years here in Toronto and/or has been to The 'Shoe.